KSO is a students’ body mainly established for the purpose of contributing to especially students’ welfare and social development fo the Kuki society. Though the birth of KSO may be attributed to the outcome of modern phenomenon it could also be seen as an estension of the traditional ‘Lawm’ organization in the Kuki society. ‘Lawm’ was an informal labour organization wherein all the able-bodied youths were the members. With the increasing differentiation of society, the popularity of ‘Lawm’ organization in fullfiling social needs have been taken over by Youth Clubs, students and youth organizations in the modern dispensation. The formation of KSO can be seen as an outcome of youth organization formed in the 1940s. It is recorded that young people felt the need for having a platform to share their ideas to societal welfare. The idea of such young people led to the birth and formation of the ‘Kuki Youth Organization’ (KYO) on December 7, 1940 at Saikot, Manipur. It had the objective of promoting and building the capacity of the youth amongst the Kukis. The first president of KYO was Ruma Zoute Hmar. After having formed and having conducted various activities the KYO took another decision and included the welfare of the Kuki society as well in its organizational objectives. During this time, the Kuki identity underwent a serious crisis and had its implications in the formation of organization among the youth of the society. In fact, the crisis began with remark of William Shaw’s book. “Notes on the Thadou Kukis’ (1929) in which he recorded that the orther Kuki tribes like Gangte, Vaiphei, Hmar, Kom, Thadou tribes. This was a major point of dissension on the part of the non-Thadous. Another controversy was the issue of lingua-franca of the Kuki tribes. Taking advantage of William Shaw’s remark, some narrow minded Thadou leaders tried to impose Thadou dialect as common lingua-franca of the Kuki tribes and considered other smaller groups as half Kuki or quarter Kuki. Under the circumstances, the Kuki identity was fragmented and may of them had flouted for new organizations like Zoumi or Khulmi Union. Besides, the Scheduled Castes and Scheduled Tribes list of 1951 recognised the common ethnicity of the Kukis by classifying them under ‘Any Kuki Tribes’ in Manipur. But some groups like the Paite and Hmar who were alienated with Kuki identity demanded for the recognition of their communities as they were not covered by the term ‘Any Kuki Tribes’ in Manipur. Following this, The Scheduled Castes and Scheduled Tribes list (Modification) of 1956 deleted the term ‘Any Kuki Tribes’ and introduced twenty-nine (29) tribes as separate scheduled tribes in Manipur. This had resulted in the fragmentation of Kuki identity on the basis of separate tribal and clan identities. Under the circumstances, assertion of segmented identities over a collective one became the pattern and every segmented group began to form their own organization to protect their own identity and interests. Therefore, the post independent period witnessed the birth of several splinter organizations lie Hmar Congress (1954), Paite National Council (1956), Gangte Tribal Union (1958), Hmar National Union 1959, the Baite National Union (1962) and others. It appears that since 1956, the population that refer themselves as Kuki seemed to be popular only to the Thadou speaking population. The term ‘Kuki’ as a political identity thus assumes significant complexity among the erstwhile Kuki tribes of Manipur. However, with objective of forming a pan-Kuki students’ body, and All India Kuki Students Conference was held at Tamphasana Girls High School, Imphal on the 20-23 October 1958. Representatives from different states and cities from Assam, Naga Hills, Lushai Hills, Tripura, Shillong etc attended the conference. Some of the popular delegates outside Manipur included Pu Haujakam Chongloi, Pu Thonghen Doungel, Pu Vumkhosei Changsan, Henkho Haolai from Assam, Mangkholen Hangsing from Nagaland, Pu Lalburlian Hrangkhawl from Tripura and many others. The congregation felt that there was a need for such students’ body to act as a social vanguard and if needed, to support the demand for a Kuki State. Some of the participants opined that constituting such a student’s body bearing the name Kuki would prove futile following the deletion of the term Kuki at that period of time. Therefore, such landmark meetings were merely concluded as ‘October Students’ conference’ of 1957. Despite such obstacles the efforts of formation of students’ Union continued in the succeeding years. In the period succeeding the 1950s, the efforts of forming such students’ body covering all the society continued to witness the birth of splinter students’ bodies like Kuki Students’ Federation (KSF) and Thadou Students’ Association (TSA) but could not sustain its existence. Miss. Neishi Kipgen, Secretary, Debate & Extn. In the following year in 1964, the KSO had expanded its organizational structure by opening its units to various educational institutions such as Kangpokpi High School, Motbung High School, Molnom High School and Sita High School. After having conducted various welfare activities for students, the KSO celebrated another milestone of Silver Jubilee on the 14th February, 1989 at Saitu, Saparmeina, Manipur. In the year 1979 the KSO was registered under the Societies Registration Act 1976 bearing regd. No. 2991 of the government of Manipur. Today, the KSO has assumed the role of an apex body of the Kuki students. The organization today, has twenty four branches and nine sub-branches and blocks across the country. In the year 2000, the KSO had set up an apex body of all KSO branches as KSO, General Headquarters. The KSO, today has branches and units in all the capital cities of India and abroad; and the various branches are managed by KSO, General Headquarters based at Imphal. The idea of having the concept of General Headquarters was conceived at a much later stage. The KSO, General Headquarters is an offshoot of KSO, Manipur. It is recorded that in the early part of nineties, there was a move to bring uniformity in the nomenclature of the Kuki students’ bodies all over India. In deference to this call, the Kuki Students’ Organisation, Manipur was rechristened into KSO, General Headquarters and those that existed in different locations constituted its units or branches. 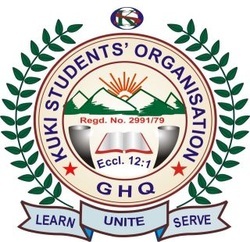 Subsequently, the KSO General Assembly held on the 7th of April, 1998 at KBC Conference Hall, Imphal passed a resolution of adopting one ‘emblem (logo) and theme’ for fostering mutual understanding within the student’s community. In accordance with this resolution, the organization also set for itself a motto – ‘learn, unite, serve’ and came into effect on the 10th June, 1998. Since then all the various branches and units of KSO shared a uniform emblem and motto. The norms of the collectivity have become loosely knit owing to the cultural lag fomented by the forces of modernization. The situation is inevitable and would continue to evolve as projected by the modernization theories. But the direction of change can be determined by phenomena or an entity and such entity could be KSO in the modern dispensation. Therefore, KSO being a student body must shun itself from such parochial mindset and act as social vanguard against the ills of the society. The KSO leadership must inculcate a sense of unity and integrity in the minds of the people. It is imperative that we must revisit and seek a panacea through our age-old tradition and values. We must identify and imbibe the good practices of our fore-fathers through which we can give sense to the emergent reality. Another focus of KSO should be educating the masses. Although we have made substantial progress in semi and urban areas, the level of literacy is comparatively far behind in rural areas. The fundamental basis of our action would be at the grass root level. It calls for voluntarism and participation of the various agencies and actors of our society. For this KSO must take the initiative and build a cordial relationship with the various actors of the society. The success of such mission would be one of our greatest achievements and the ‘fruit of education’ can be used as a tool of reconciliation in building the Kuki nation.